Rushing Fall (More Than Ready) wins the QE II Stakes at Keeneland on 10.13.2018. Javier Castellano up, Chad Brown trainer, eFive Racing owner. 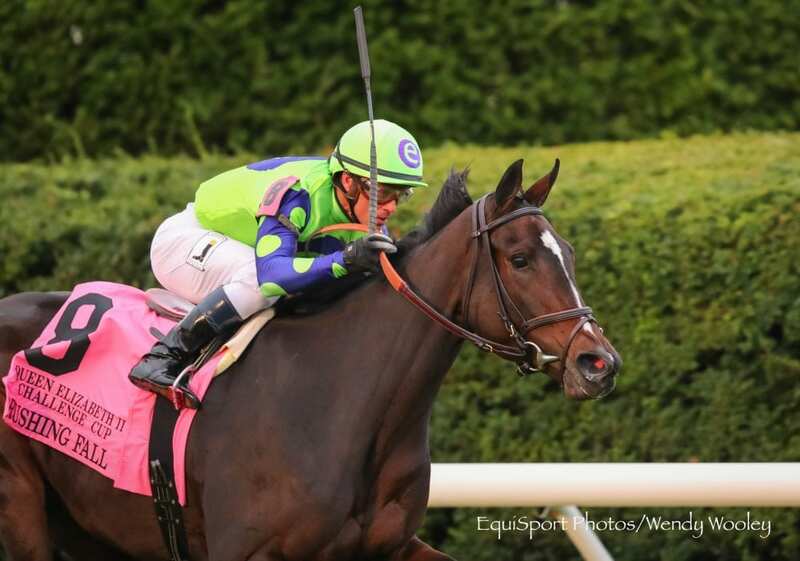 Winner of last year's Breeders' Cup Juvenile Fillies, e Five Racing Thoroughbreds' Rushing Fall continued to build on her impressive resume this Saturday with a win in the Grade 1 Queen Elizabeth II Challenge Cup at Keeneland. The sophomore daughter of More Than Ready, ridden by Javier Castellano for trainer Chad Brown, hit the wire 1 1/4 lengths in front as the 2-5 favorite, covering nine furlongs over the firm turf in 1:50.42. Fatale Bere was quick out of the gate, but Castellano let Rushing Fall push up and take command before the clubhouse turn. Gliding along with her ears pricked a few paths off the rail, Rushing Fall set fractions of :23.91 and :49.22, about two lengths ahead of Fatale Bere. Nyaleti and Mission Impassible were the next closest pair, with a gap back to Princess Warrior following them. Rounding the far turn, Castellano waited to ask Rushing Fall until he was challenged by Mission Impassible. At that point, Rushing Fall flew forward into the bridle to fend off her rival, flying under the wire a winner by 1 1/4 lengths. Mission Impassible had to settle for second, while Nyaleti had traffic trouble in the turn and ran evenly late to finish third. Princess Warrior was fourth. Bred in Kentucky by Fred W. Hertrich III and John D. Fielding, Rushing Fall was a $320,000 yearling at the Fasig-Tipton Saratoga Select sale. She was undefeated as a juvenile, culminating with her Breeders' Cup victory, and won her first start of 2018 at Keeneland. Rushing Fall suffered her only defeat by a neck in Churchill Downs' G3 Edgewood, but rebounded to win the G2 Lake Placid and another G1 in the QEII Challenge Cup. Overall, Rushing Fall owns seven wins from eight starts with earnings of over $1.6 million. This entry was posted in NL Article, Racing and tagged bob edwards, Chad Brown, Javier Castellano, Keeneland, More Than Ready, qeii, Queen Elizabeth II Challenge Cup, rushing fall by Paulick Report Staff. Bookmark the permalink.